Hair loss from weight loss is generally due to a condition known as telogen effluvium. Under normal circumstances, hair grows as much as ½ inch per month for approximately 2 years then goes into a resting phase knows as telogen. At the end of the resting phase, old hairs fall out to make room for new hairs. Approximately 10 percent of the hair goes into resting phase. Physical and emotional stress from dieting can cause more hair than usual to go into resting phase, and fall out when new hairs come in. 1. Make sure you are eating enough calories. 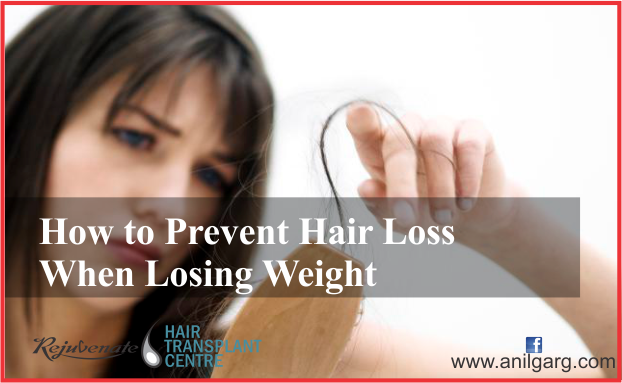 While you do need to restrict calories for weight loss, restricting too much can cause hair loss because the body does not have enough energy to support hair growth. 2. Eat enough protein, which is a major component of the hair. Protein needs are based on individual factors such as body weight and activity levels. 3. Incorporate whole grains, fruits and vegetables into your diet. Whole grains contain iron which, according to the National Anaemia Action Council, is a major factor in hair loss. Fruits and vegetables also contain vitamins A, C and E as well as zinc, which all contribute to hair growth. 4. Take a medical treatment nutritional supplement, such as a multivitamin, which contains at least 100 percent of your RDA for all vitamins and minerals.